Sounds like a stupid idea but turned out pretty well. A few weeks ago on the beach, a colleague told me about Moku Nui, a small island with a seabird reserve just off the east coast of Oahu. It is the smaller of the Mokulua islands but access to the larger is not permitted while on Moku nui access is permitted to part of the shore. The difficulty is getting there. It is quite popular to go there by kayak or canoe but I don't have either and since Hawai'i is such a popular holiday destination, rentals are very expensive here. Especially since as a photographer I of course want to be out with the first light so I would have had to rent a boat for two days. But looking at the map I realized that with 1.5 km from the shore, the distance would be short enough for me to swim. Problem being of course that I wouldn't be able to take any equipment with me unless I figured out how to transport it without getting it wet at all. Getting ready at Lanikai beach with Moku Nui on the left side on the horizon. The solution was finding a reliable dry bag. I had wanted to get one anyways since I wanted to go swimming in the mornings at the beach before going to university but had nowhere to leave my laptop etc. while in the water. I ended up getting a buoy design dry bag with inflatable compartments as many triathletes use them for training and after testing it for over a week with no leaks, I felt confident that it could keep my camera reasonably safe. Of course I double bagged everything within the dry bag, too so even if a little water intruded it wouldn't damage my camera. And a little risk always remains when taking gear into nature. So, I went out in the dark and swam over with first light. I could not make it on the island with the actual sunrise. I had a few brief moments of nice morning lights shining through the clouds but mostly unfortunatley it was rather grey. Brief Moments of Morning Light. Wedge-Tailed Shearwaters breeding right behind the barriers. The largest part of Moku Nui is restricted from access to protect the seabird breeding grounds particularly the shearwaters who breed in shallow dug holes in the ground. The main species on Moku Nui are the wedge-tails shearwaters and bulwer's petrels. I did not see any petrels this time but I suspect that they are simply breeding further up to the inside of the island. ANd there was not a lot of flight activity. But I could shoot several nice portraits of shearwaters sitting in the grass and I have taken quite a few nice flight shots of them while I was at sea on RV Sonne north of New Zealand. One of the most amazing things to see of course always are young animals and chicklets in particular. Mostly you don't see the nests of the shearwaters hidden in burrows in the ground but I could find one adorable cchick that was sitting outside underneath the protection of an overhanging rock. 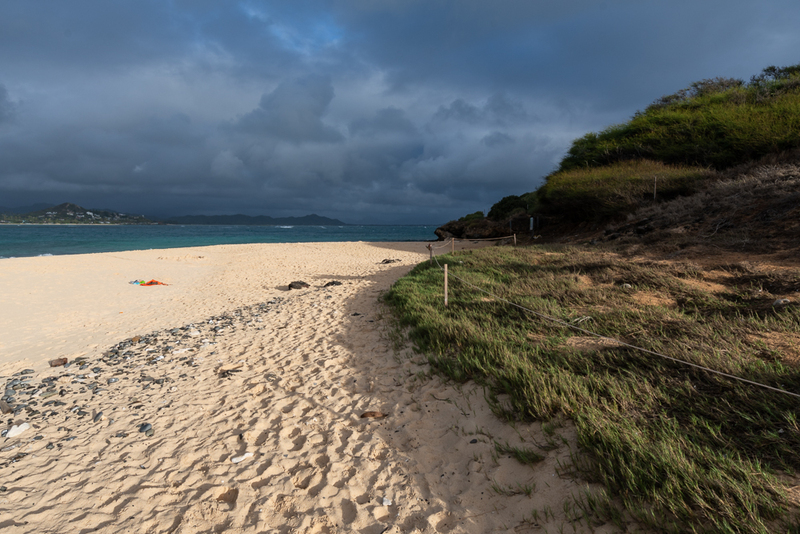 As the morning progressed, it did not seem like there would be more light and as the first tourist were arriving in kayaks and outrigger canoes, I decided to call it for a day, pack my gear carefully into the dry bag again and return to the shore. I am not fully satisfied with the pictures I got with the short moments of light as I wasn't quick enough to take the bird portraits when the sun briefly came out but I will definitely return another time or two. The swim is fun over a wide, shallow reef and not too long and transporting my gear like that worked out really well. Though next time I will have to wear some long-sleeved shirt to protect against the jellyfish. I got stung multiple times on the way out, lukily none of them were painful enough to keep me from swimming but I can't count on always being that lucky. Portrait of a wedge-tailed shearwater.